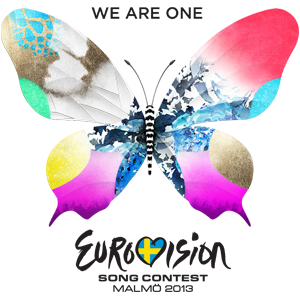 Since I started this blog a scant four and a half years ago (I'm old), I kept promising myself that I'd do a Eurovision coverage post. In fact, at one point, I wanted it to be a recurring, annual event at Melismatic. (::crickets::) Long story short -- yeah, that never happened. And then 2009 occurred and I became a KPOP maniac. But that was then. This is now. It's 2013, damnit, and we're gonna talk EuroPop. I've had a listen to all of the 39 entries and below are my 13 favorites/choices for Semi-Finals/Finals. Feel free to sound off in the comments who YOU think should win and what you think of these, or any of the other competitors', jams. Let's get Euro-Centric, ya'll! 16 songs total are featured in this round. 10 will move on to the final. Below are my faves from this semi. 18 year old Natália Kelly is actually a Brazilian-American singer born in Connecticut and raised in Austria. In the mid 00's, she was a member of a short lived pop Austrian pop group called Gimme 5 and in 2011, she appeared on the Austrian version of The Voice. Her self titled debut album was just released this month in Austria. "Shine" is her debut single. It's pretty generic midtempo pop sparkler -- the real interest lies in Natália's gorgeous, clean vocal, the slight minor bend to the key, and the surprise inclusion of a xylophone in the background. Hannah (last name: Mancini) is a pop music season vet, performing at Radio City here in the States and working on various soundtracks to Disney films. She's American by birth, but resides in Slovenia and previously competed for entry at Eurovision in 2011 (but wasn't chosen). "Straight Into Love" was co-written by Hannah and sounds a bit like the epicness that was last year's "Euphoria" (by Swede Loreen), with a 2013 twist. It's a little bit dubsteppy and is perfect for the discotecque. It might just be my fave of all of the finalists. Werk. 20 year old Emmelie who first gained notoriety in her homeland of Denmark when she took park in the Dansk Melodi Grand Prix (MGP), the Danish means to selecting their Eurovision contender. She apparently told everyone she her family's lineage includes Queen Victoria of England. Whether or not this is true has become a bit debatable by some folks and the shtick has been heretoforth dropped from Emmelie's marketing package. Her debut album, Only Teardrops, is due for release in Denmark in early May just before the Eurovision contest begins. "Only Teardrops" is her first single. It has a somber, wistful quality to it, complete with icy flute solo(s). Then as the chorus kicks in, so do the drums. 27 year old Zlata is a veteran of the Eurovision competition contention -- this marks her third attempt to represent her native Ukraine. To my ears, this song basically sounds like an extravagant, Broadway-esque, mega-crescendo, Act I finale number with a beautiful Disney-like sheen. Like it belongs in "Tarzan" or "The Lion King" or something. Seriously. I cannot possibly be the only person who had no idea where the hell Montenegro was, right? I need a globe or something. Anyhoot, although this song is only credited to Montenegrin hip hop group (amazing) Who See, the song features a collab vocal from Montenegrin singer Nina Žižić. It basically plays out like a 2013 revamp of a C+C Music Factory or Black Box dance jam, remixed by Skrillex. It's one of those "everything plus the kitchen sink" numbers and I keep on hitting replay. It's an addiction. Gorgeous 27 year old Ms. Lanskaya is a bit of a trouble maker, apparently. She was set to take part in Eurovision for Belarus last year with her single "All My Life", but was disqualified when rumors swirled the competition was rigged for her to win. This year, apparently she's in the all-clear. Her original song, "Rhythm of Love," gained her the title for Belarus, but for some reason, the song was switched back in December to "Solayoh" -- a parade-like floor-stomper with a singable chorus of "Solayoh! Solayoh! When the sun is always shinin' on ya! We play on! We play on! To the rhythm of the Cha Cha!" (Spoiler Alert: It's not really a Cha Cha at all.) Basically, the lyrics sum up with my life when I hear the best song ever so yeah...I'm down for that. Put your hearts up! Not too much is known about Irish singer/songwriter Ryan Dolan (Chandler Bing Joke Time: Could his name be more Irish? ), but his single is a pretty passable sparkly midtempo ballad a la OneRepublic or so. Moje 3 is a Serbian girl group trio (amazing!). Basically, they are a Serbian version of Little Mix (except not like them at all in the slightest) -- 18 year old Nevena, 19 year old Sara and 20 year old Mirna met through a popular music program in Serbia called "Prvi Glas Srbije" (The First Voice of Serbia) this past year, each auditioning as a soloist. The three ladies placed first (Mirna), second (Nevena) and third (Sara) but rather than go it alone, they joined forces as Moje 3 (English: "My Three") for a one-off single (and apparently an English version is imminent?). Once the competition is over, the three singers are expected to each release solo material. 17 songs total are featured in this round. 10 will move on to the final. Below are my faves from this semi. 21 year old music student(?) Farid Mammadov was born and raised in Azerbaijan (again, had no idea where this country was until looking more into him). An avid songwriter, he claims Stevie Wonder as his main musical influence. His song for Eurovision, his third single in midtempo "Hold Me," has a slight Darin kind of quality to it. Stay with me here. Koza Mostra is a six piece Greek band (with an accordian and trumpet -- already amazing) and their entry song, "Alcohol Is Free," basically plays like No Doubt in their initial ska days on the set of the Broadway musical Mamma Mia. Anyone? Anyone? 27 year old Margaret Berger is a bonafide popstar in her native Norway. She came up through Norwegian Idol back in 2004 where she placed second (she actually covered The Beatles, Bjork, Alanis Morrissette, Whitney Houston and Sophie Ellis-Bextor...in the same season. Oh, how I love you, Scandinavia!). She's gone on to release two albums with a third titled Chastisement on schedule for 2013. The first single from the project is "I Feed You My Love", a downright Robyn meets Kimbra synthfest of epic proportions. The song has gone to #4 in Norway. Fun Fact: the song was produced by Swede team Machopsycho who did P!NK's "Bad Influence" and co-produced Esmee Denters Outta Here album with Justin Timberlake. The 20 finalists from the semi finals will go on to compete for the title against returning champs Sweden, and the "big countries" in the UK, Italy, Germany, Spain and France -- who are considered automatic finalists. Here are my faves out of the already announced finalists. Lovers of pop music know the Cascada brand well. "Everytime We Touch", "Evacuate the Dancefloor", "Pyromania". All fantastic pop stompers. This year, they will be representing their native Germany with their latest single, "Glorious". No sooner did the song premiere did the German Broadcast group immediately start shooting it down for claims of plagiarism (a complaint Cascada is pretty used to at this point, I'm sure) -- stating it sounded too similar to last year's Eurovision winner "Euphoria". However, in February, the charges were dropped and "Glorious" was in the free and clear. Spoiler Alert: it does sound a bit like "Euphoria", but that's part of why it's so amazing. It's not as good as past Cascada hits, but it's still a jam. It has since gone Top 10 in Germany. 33 year old pop singer Amandine rose to relevance in her native France after winning the sixth season of "Nouvelle Star", the French version of "American Idol", back in 2008. She's released two albums since, including her hit debut in 20 m². Her latest single, "L'enfer et moi", is possibly from an upcoming album release and is deliciously dark and sanguine, and more than a little bit petulant, as only the French could really do with any justice. Her voice has a unique huskiness to it that recalls Anastacia a bit. It also relies heavily on lazy guitar twangs. Love.